Potential attendees can complete the registration form but are given a notice, before the payment options, that their registration is not complete until the admin approves them. 1) Inside the Attendee Reports page of Event Espresso you can quickly approve registrations by clicking the “Approved” link action. 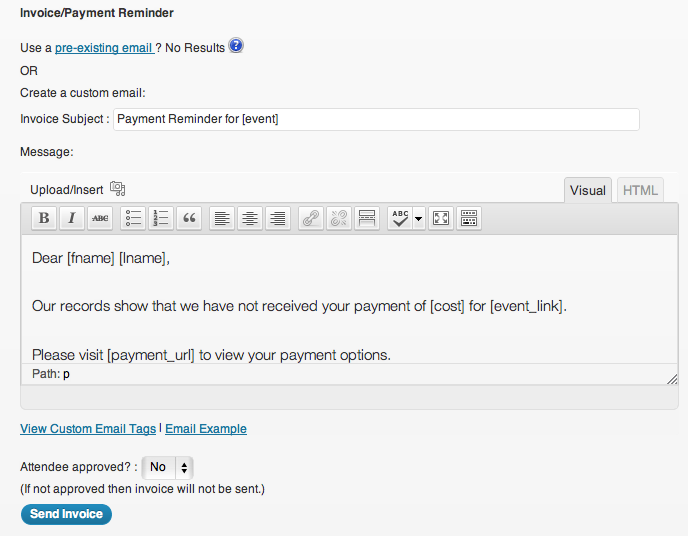 2) or you can edit the payment record (cash icon) and manually approve the attendee by using the Attendee approved? : Yes/No action. Once approved attendees will receive an invoice/payment reminder asking them to finish their registration. You can also specify in your Event Espresso general settings whether registrations with or without payment count toward your attendee limits for events so you can reserve seats for people who have been approved but not paid or only reserve seats for those who have paid. This works a little differently in Event Espresso 4 than it did in EE3. Instead of a specific control, Event Espresso 4 provides this functionality when the “Default Registration Status” is set to “Not Approved”. The default registration status can be configured on a per-event basis. 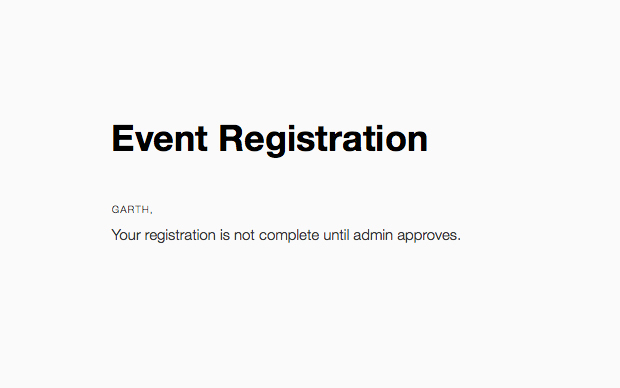 The event can have one default registration status. The options are: Approved, Not Approved, and Pending Payment. Approved, means they will be approved no matter if they have made a payment or not. Not Approved, means they will not be approved or allowed to make a payment without prior approval. Attendees have to submit their registration, and the admin is notified that the registration is awaiting their approval or not. Upon setting Approved or Pending payment, the registration is progressed. Pending Payment, means that attendees are required to make payment in full before they are approved. The “Not Approved” registration status sends a message to the registrant that their registration needs to be approved before they are allowed to make a payment. The event organizer also receives an email that they need to review a registration. Once the registration is approved, the attendee can make a payment to finalize their registration. If no payment is required, the attendee is booked for the event. Pending Payment requires payment in full before an attendee is approved. And has been said, Not Approved means the registration needs reviewed, and Approved or set to Pending Payment in order for the attendee to make a payment. Organize your events to make it easy for attendees to find the perfect events, then use the categories again to suggest new events. Receive event registrations using your WordPress website and let your attendees pay offline for their registrations with invoices.